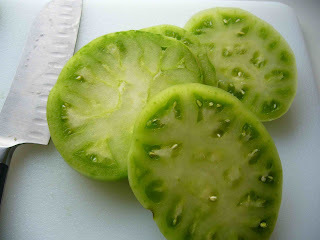 I first tried fried green tomatoes when I was little girl visiting relatives in the south. I thought the whole idea of eating tomatoes that weren't ripe yet was weird and I wasn't really interested, but today I love them. Still on ripe tomato watch, I decided to make some fried green tomatoes to satisfy my homegrown tomato craving with something a little different. Pour vegetable oil into a heavy pan (I prefer cast iron for shallow frying like this) and place over medium heat. Slice tomatoes into 1/2 inch thick slices. Set up three bowls for breading by placing 1/2 cup flour and 1 t salt in the first bowl, 2 whisked eggs in the next bowl and 1/2 cup flour, 1/2 cup cornmeal and 1 t salt in third bowl. Once the oil is good and hot (but not smoking) bread the tomato slices. Working with one tomato slice at a time, dip first in the flour, shaking off any excess, then in the egg wash and finally in the cornmeal flour mixture and add to pan. Fry each slice for 6 - 8 minutes on each side until golden brown. Remove from the oil and salt each side lightly to taste while still hot and enjoy! I can taste them now. Delicious. Did you first taste them in Memphis or Mississippi? It was Tchula, Mississippi. The tomatoes were from the garden, and the kitchen, of one June Durff. If only I had appreciated them back then! 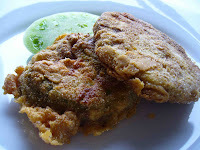 I have always wanted to try fried green tomatoes. Looks yummy! I'm waiting on ripe tomatoes from my garden too and planned to make some fried green tomatoes too, I am getting so impatient waiting! !